Saturday 19th May Penzance to Sennen 13 miles. 6 am Up with the larks..
7am Colin and Graeme arrive within two minutes of each other. 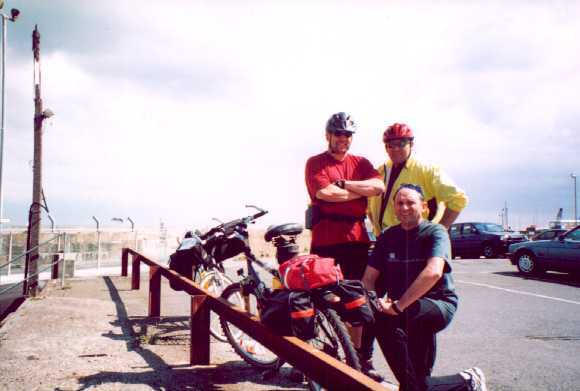 We had to take the bike rack ,to get the Bikes and gear in the Hired Renault Laguna. Alan from over the road was out admiring the car. Anyway loaded up and away for 8am... We sped down the motorway a pretty uneventful journey roads were quiet. We had a coffee stop at Strensham and then south to Exeter along the A 30 . As we neared Penzance we passed a lot of cyclists all on the same bikes spread out over a long distance obviously end to end enders. We arrived in Penzance approx 3 pm and found the railway Station and off loaded. The Hire Depot was in the same car park. The Sun was shining no wind and the cycle track was right next to the car park, everything was dropping nicely into place. Colin dropped off the car and then snuck down the back of the row of cars so we were not sussed putting a bike rack away? Colin had a fleeting idea of dismantling and carrying the bike rack, but no way! Anyway we rang Jane to se if she'd got a bike rack and she'd ordered one for £34 . We thought that was steep and Colin remembered Karen was in Darlington shopping so we rang her, lucky she was in Binns so she could just POP over to Boyes and sure enough there was a cycle rack for 18 pounds. So she bought that and we ditched my old one. As it worked out later it was good move because the new one was a far better design and fit for my car. WE set off the bikes loaded up well and one or two minor adjustments ,we set of via the Flatter route to Sennen (Avoiding) the steep coastal route? Cycled through Penzance and then Bang Cheyne Hill and what a hill it went on for ever. Fortunately Graeme needed a lottery ticket so we had a short stop, unfortunately he got served to quick. At the top Colin expected to se the satellite dishes pointing downwards. We pedalled up onto the tops and to undulating countryside. It was as though we'd never been away from our cycling trips. We followed the road passed the Merry Maidens Stone circle and again up and down some steep hills . One hill near Logan Rock we stopped for drink of Orange, little did we know but just round the corner was the Logan Rock Pub? Eventually we cycled into Sennen and down the main road till we found the Digs, Holmefield. What wonderful accommodation and a superb position, overlooking the Coast. Its was a lovely Bed and Breakfast and they had a small bar so we had Beer and Cider in the Garden. The rooms were all en suite and very spacious. We changed and walked down to the Old Success Pub in Sennen Cove right on the coast line. It was a good night Good meal, a few beers and a good natter about all and everything. I had Fish and Chips which were excellent. The Beer Sharps Doom was OK but the Cornish Knocker had to go back. What is it with me and the Bottom of the barrel but we had two more Doom which were OK.
We walked back up the hill all tired, but it was a beautiful night and the walk had great views over the bay Back to the Digs and I know it didn.t take much for me to crash out.